Challengers are you ready? Be prepared to go head to head in a fun competition through The Gauntlet Obstacle Course rental. Each competitor will maneuver around multiple brightly colored elements (from overhead obstacles to horizontal and vertical pillars), climb the safety-padded foam step rock wall, and finish their challenge by going (safely, one at a time, feet first) down the 10’ high inflatable dual-lane slide. Smiles will be contagious as each racer squeezes, crawls and jumps through this exciting course. 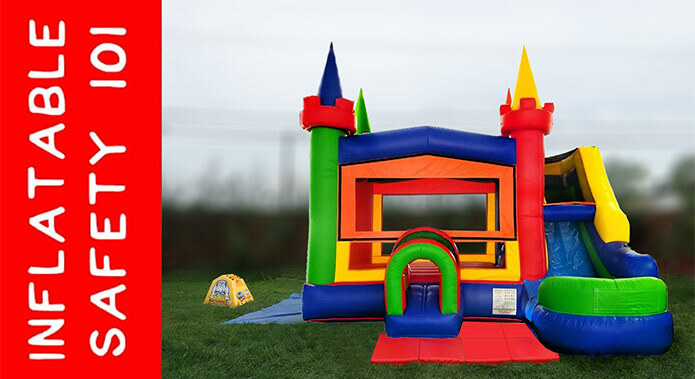 Feel safe when your little ones maneuver, climb and slide on the inflatable rental: this inflatable obstacle course has many safety features, including full length containment walls around the perimeter of the course as well as between the double slide, providing complete separation from those going through the course and those climbing and sliding. The slide loading deck is fully enclosed, has bumper rails the length of the slide, and bumpers at the end of the slide landing area to ensure no one slides directly onto the ground. With both the entry and exit on the same side of the obstacle, it makes it ideal for those supervising. So, what are you waiting for? “Throw down the gauntlet” and watch your bouncers take the ultimate challenge in The Gauntlet Obstacle Course. Safety is our top priority, above everything, EVEN FUN (sorry, kids!). This inflatable obstacle course rental includes a Watchdog Series 2 Blower Siren (to detect blower malfunction or other loss of air) and ASTM-approved, 2" thick, non-slip safety/landing mats (to create a safer area around the entrances/exits of your inflatable obstacle course rental), as well as 18" stakes to properly anchor your inflatable obstacle course rental - all free of charge! While we do our best to source the safest inflatable rentals, slips, trips and falls can occur, especially without proper supervision to ensure all Inflatable Safety & Operating Instructions are followed at all times.